In-person class with personal coaching. 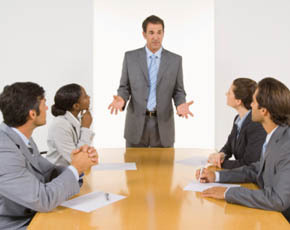 Transform your public speaking skills in a friendly small-group setting. As in all Christopher Leadership courses, you will practice every skill in class with personal coaching. At most 8 students, and a team of 3 experienced instructors, interact around a boardroom table. Three Saturday morning classes and a Sunday graduation lunch for you and a guest, all of which are included in your tuition and required to graduate. This course was full but a student has cancelled. People from the waiting list will be given an opportunity to register, in order of their place on the list. If you have been given a code to unlock registration, please enter it below. Please take care to match upper and lower case, with no blank spaces. West, 110 Didsbury Road, off Terry Fox by Canadian Tire, Saturday May 11, 18, 25 9:30-12:30. Sunday May 26 noon to 2 pm at 330 Kent St.
See below how your choices affect your actual tuition. By Interac E-transfer from your bank account By cheque to CLC Ottawa By credit card through PayPal. Please mail your cheque to CLC Ottawa, 469f Moodie Drive Ottawa K2H 8T7. On the notes area of your cheque please write the name of the course and the name of the student, to help our treasurer connect payments to registrations. Please use your bank's online banking app or web site TODAY to make your Interac E-transfer (secure online debit payment) to secure.payment@clcottawa.com. Please include in the notes area the name of the course and the name of the student, to help our treasurer connect payments to registrations. Please provide your security question and answer below. After your payment has been received we will email a confirmation of enrollment. You will receive your official tuition receipt for income tax purposes during your course. You will be taken to PayPal for payment when you submit this form. We add a service charge to help offset the extra processing fees involved. You do not need to have or create a PayPal account to use this option. CLC Ottawa is a non-profit educational institution, teaching effective communication in Ottawa for over 50 years. Please visit the other pages of our web site clcottawa.com to learn more about our history, and our other courses. To inquire about group pricing and on-site courses, please send an email to christophers.ottawa@gmail.com.